In China it is well known that “Women Hold up Half the Sky”. At least that is what I was told several times when I was there during three weeks in September 2014. “Women Hold up Half the Sky”. 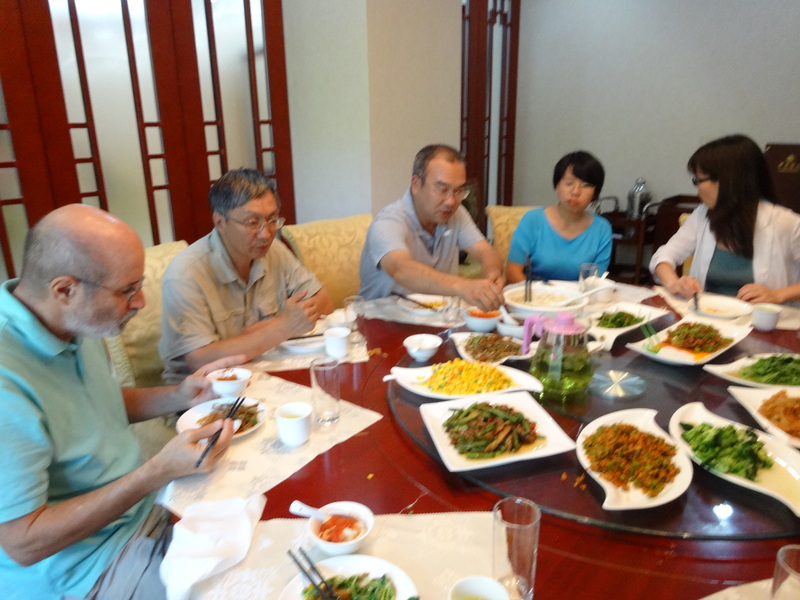 My husband, Mark, and I were invited to China by Beijing Normal University. Mark was invited as a research scientist and I was invited to assist graduate students to practice English. My job was to hang out with graduate students each day and hold a conversation in English. I got to choose what we would talk about and the issue of Women’s rights in China soon grabbed my attention. The reason Women’s rights in China caught my attention was because of the round table dinners my husband and I were invited to nearly every day that we were in China. Over the span of three weeks, that is a lot of round table dinners! There were many things that seemed odd about these meetings at the round table and I want to go over a couple of things that intrigued me in reference to women in Chinese culture. Every dinner or lunch, we were invited to, had the same format. There is always a separate room in a restaurant or meeting hall with a large round table. When we enter the room everyone mingles around until it is determined where everyone will sit. A discussion ensues about who gets to sit at the head of the table. Even though the table is round, the spot against the back wall is always the head of the table. The person seated at the head of the table had to be the most important person in the room. Each person defers politely to the other until the most important person is agreed upon. There is usually a good bit of friendly banter until the issue is resolved. The next two important people sit next to the most important person at the head of the table and so on until the table is fully seated. I noticed early on that there were never any women at the head of the table unless it was to sit next to her husband. Only one of the many dinners I attended had an important female professor near the head of the table. Mainly, the women were collected at the least important side of the table. The second thing that I noticed was that no one ever drank anything unless a toast was made. There were times when I became quite thirty, waiting for a toast to be made. A toast can be made between two people or the whole table. Men are expected to drink alcohol and often strong clear liquor is served. As the dinner progresses and more and more toasts are made, the men are strongly encouraged to drink ever larger quantities of liquor. My husband had to swear he was allergic to alcohol at times to avoid consuming large quantities of liquor. Women on the other hand are never pushed to drink liquor and often drink something non-alcoholic like tea or juice. I was very relieved about that. By the end of the dinner many of the men, particularly the men at the head of the table, were sloshing drunk. It became clear to me that much business, including making contacts and resolving plans is done around these round tables. Many deals are struck over a toast of liquor. This led me down the road to asking many questions concerning equality for women in China. I asked several graduate students as well as some of the professors that I sat next to at these round table dinners. I started with the most basic question: Are women equal to men in China? The answer that I received was a resounding “Yes!” The Chinese I talked to went on to clarify things like: Chairman Mao made men and women equal soon after he came into power in 1949. It was Mao who said that “Woman hold up half of the sky”. I was also told unequivocally, that China is more equal than anywhere else, even the United States! I was told that at Beijing Normal University, woman entering college have a separate entrance exam from the men that is much more rigorous, because women score so much higher than men on these exams. This is one of the results of equal education for women. I was also told that as a result of equal rights for women, many women are excelling in sports and outperformed their male counterparts at the Olympics. It was clear that women had made many strides since the days of foot binding and from when Mao declared men and women equal. All the Chinese I talked to presumed that equal rights for women were a good thing and they were clearly proud of the strides that had been made for woman in China. I felt uneasy with these answers though, since my experience at the round table dinners did not suggest that women were equal to men. I never saw a woman sitting at the head of the table. So I was prompted to ask: “What about women in positions of power? Are there as many women in positions of power as there are men? Everyone I asked said; “No, there were not many women in power”. Of course I had to know why not and it surprised me how many people answered the same way: I was told by both men and women that “Women do not like that kind of work”. Men also sometimes added that “Women do not want to give up their power in the home and that there is so much to do in the home.” I found it interesting that only the men said this. One woman told me that she believed that these round table business meetings with all that drinking were an impediment to women getting in. It was hard to get invited to the head of the table and women do not drink like men. You are expected to drink if you are at the head of the table. I then asked the young women graduate students if they will be contented to work in the home and let their husbands have the better paying jobs. None of them seemed satisfied to do that. I asked the young men graduate students if they think they will be contented to have their wives do all the work at home. They thought they would like that, mainly because none of them knew how to cook, but they didn’t think their wives would agree to do that. The young men were more concerned that it might be difficult to find a wife because there are more men than women in China as a result of the one child policy. My experience in China with the round table dinners and the questions that it evoked about women’s rights in China gave me just a small glimpse into Chinese Culture. There were many more questions that I wanted to ask but I only had three weeks. I am grateful to all the Chinese who answered my many questions thoughtfully and sincerely. I am very curious to see what happens next with all these educated and talented women in China. 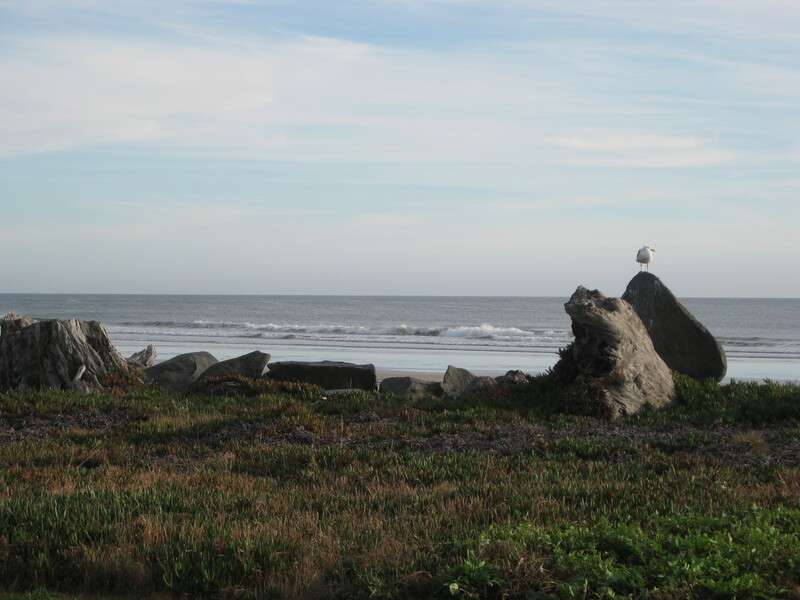 The old hotel sits on a small bluff just in front of the Pacific Ocean, the front one long row of doors, the back a row of patio sliding doors leading out to a long grey and weathered wood deck stretching the length of the building. Our room is close to the middle of the building, putting us right next to the elderly couple. I see them for the first time as I come out of our room through the sliding patio doors to check out the view of the ocean. They are sitting in a couple of the green plastic chairs that are stacked on the deck in short piles between rooms. I am drawn to the elderly couple more than I am drawn to the sound of the surf and the blue sky over the ocean that is just now taking on the deeper hues of the late afternoon sun. But I don’t want to be rude by staring at them so I snap pictures of the pretty scenery. I toddle down the little dirt trail that leads to the ocean, not going far, teetering along on my block feet that have been left numb, wooden and painful from chemotherapy, feeling a bit like a Weeble that won’t fall down. I have a cane in one hand and my hat on covering my bald head. I won’t go very far, fearing my feet will give out, becoming too painful, not wanting to risk getting stuck somewhere and not being able to get back. Every day now my feet have been getting a little bit better, each day more feeling coming back, the pain little by little going away. When we started on this trip from Tucson to Oregon, I was in a wheel chair. I started walking at Yosemite National Park. One dose of chemo put me in the wheel chair. It also caused me to lose feeling in my hands. The doctor wanted me to continue the chemo and offered to give me lower doses or different kinds of chemo that may not have the same effect. She could give me no assurances about my hands and feet ever returning to normal. “Most people get their feeling back,” she said. But most people did not get the extreme reaction that I had. “Do I have to choose between living and having the use of my hands and feet?” I asked her, knowing her answer already, just wanting her to see my dilemma more clearly. The truth was that I never believed in the chemo. I had tried to convince myself that it would work, that the chemo was like an army of good little soldiers killing off the bad cancer cells. I even went to a hypnotherapist to try to reason with the inner voices that were screaming against the chemo, telling me it would kill me. I wanted to live and I knew that the chemo gave me better odds of survival. I wanted to do everything I could do to increase my chances, not wanting to let my family down because I was too much of a baby to do the chemo. But the hypnotherapy was a failure and the inner voices continued to scream. They screamed when they stuck the large needle into my vein to pump the chemo in. They screamed louder when they sent me home with the chemo bag strapped to my waist pumping my belly full to overfull. They screamed in horror when they gave me the hazardous waste bags and clean up gloves and gown to wear if I needed to clean up any leaks of the chemo that was being pumped into my body. I chose not to do anymore chemo after that first dose, choosing instead, cleaning up my diet, taking supplements, and travel. I would not be on this trip to Oregon if I had continued the chemo. I would be isolated at home, kept far away from any germs that could disrupt my chemo compromised immune system. I have always chosen travel therapy when things get rough. Even when I was confined to a strict work schedule and things got just a little too much; I could relieve the stress by a nice 15 minute drive down a stretch of highway, so long as the highway was headed out of town. I head back to our room, watching the elderly couple as I pass them, as the trail winds back in front of the hotel, taking peeks at them as I look up from the trail, careful not to stare. The woman has long straight white grey hair that looks like it had once been thick but is now thinning, now it’s pulled back into a knot tied loosely on the back of her head. She is average height and a bit lanky with only that extra bit of body fat that old people gather about them. The man was also thin but taller and walks with just a bit of a hunch but not much. What catches me is how happy they are together, the man busily running in and out of their room getting supplies for a late afternoon lunch on the patio, the woman setting up the little table they pulled out from their room, covering it with a small table-cloth, centering the plates and silverware on each side, making everything look pleasing. She smiles at me as I walk past, her warm genuine smile and blue eyes pulling me in. Mark and I take a seat on the patio next to the old couple, un-stacking a couple of the green plastic chairs, arranging them to look out over the ocean, watching the gulls and pelicans who are searching for their afternoon snack, watching as the sunset starts to take on colors. An easy conversation starts with our neighbors. They own a ranch in California and come to this hotel every summer for their vacation. This will be their last summer at this hotel because tomorrow they are going to put a down payment on a ramshackle cottage in town where they will spend their future summers, renovating and fixing it up. They are excited about the purchase and happy to have yet another project together. They are easy talkers and I get the feeling that they are happy with their life together. We talk about how lovely the sunset is from this patio and they say that is one thing they will miss at the cottage next summer. Mark pulls out his guitar, finger picking soft tunes, as we listen while relaxed and contented half smiles take over our faces, until the night chill forces us indoors. We left the old hotel the next morning, never seeing the old couple again. I wonder about why I was so attracted to them and particularly to her. I can still see that warm smile and pretty grey hair all swooped in a bun. I can imagine her taking the hair pins out at night as she walks around in her nightgown, white grey hair falling around her shoulders, putting out a late night cup of tea for her husband who smiles back at her and adores her. I can still see her blue eyes bright against her cream peach colored skin, the wrinkles framing her face and eyes as she smiles. It is the life in those eyes that I am attracted to. She is so present and alive with those eyes. In the days and weeks after I left the old hotel, as the woman’s smile continues to interrupt my thoughts, I realize what it is that I was so attracted to. I see me at her age and want that. I want to grow old. I had always resisted growing old. I thought of age as only getting wrinkles and new aches and pains, a slow decline. But now, after getting cancer and realizing that there is no guarantee of old age, I want it, I want old age like I want cake at a birthday party. The old woman gave me a vision of old age that is not just about wrinkles and aches and pains. When I saw the old woman I saw what living this life was all about, having a man who grows old with me, doting on me, finding new projects to dig into together, the wrinkles adding warmth to my smile, keeping that light of a life well-lived in my eyes. We are still in monsoon season in the middle of August, the rains adding humidity to the usually dry air of Tucson. I am sitting on the back patio, it is early in the morning, and the sun is still safely behind the house causing shadows everywhere. The shadows make dark creases in the folds in the mountain that fills the sky in front of me. The sun is harsh against the brightly lit orange jutting rock faces, the long shadows well-defined in contrast to the sunny surfaces. The fingers on the hand of finger rock stand out in the morning sun, bright between two other jagged mounds of rock, one in shadow, the other mottled sun and shadow. Saguaros dot the lower hills casting thin dark lines, the light shining strong against their tall lean sides causing them to stand out like bright shiny candle sticks on a mound of green. I call it green anyway. I now have Tucson eyes. When I came here from Wisconsin the landscape looked craggily and brown. Now I see the green. All I see is the green. The monsoons have left behind a cacophony of new sprouts in all shades of green which blend into a sage color from this distance. There are humming birds flying past me, whizzing over my head, their buzz like light sabers as they swoop near, two are racing each other around the patio, swooping down across the valley before coming back again for another round. 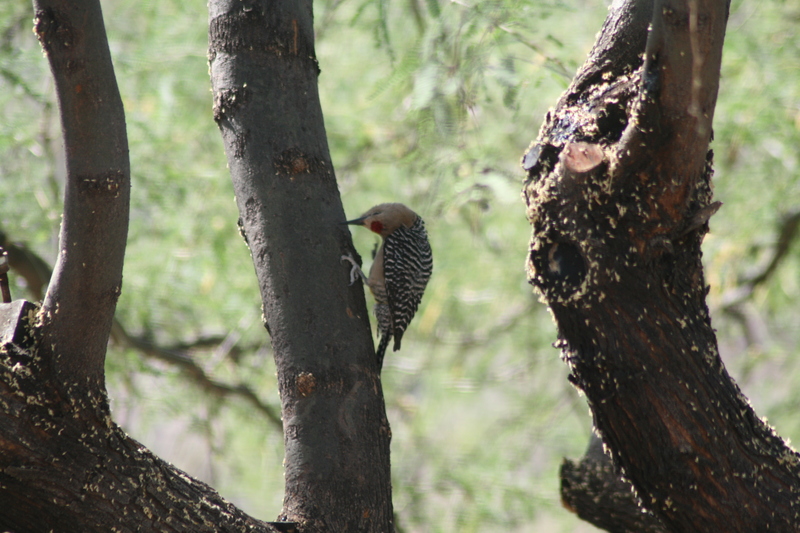 One takes a breather, sitting on the dried stem of a nearby grape-vine, fluffing his feathers one time, he eyes the humming-bird feeder, then zooms over to light on the edge of the huge mesquite tree, still eying the humming-bird feeder. A finch stops to rest on a thin branch just above the hummer, he is too close, the hummer flies up, hovering in front of the finch to give the finch a piece of his mind. The hummer darts in and out making little jabbing motions towards the finch like a boxer, but the finch holds his ground, not budging from his perch, he is twice the size of the hummer after all. A rabbit is pulling at a low hanging branch, he is statnding on has back legs pulling down a branch, trying to get at the green leaves just out of his reach, his ears standing tall on his head, the branch making a racket of crackling noises. A male cardinal lands on a branch of the small orange tree to my left, his bright egg-yolk-yellow beak and black face distinguishing him from his partner, how brave to fly around in that red plumage for everyone to spot. 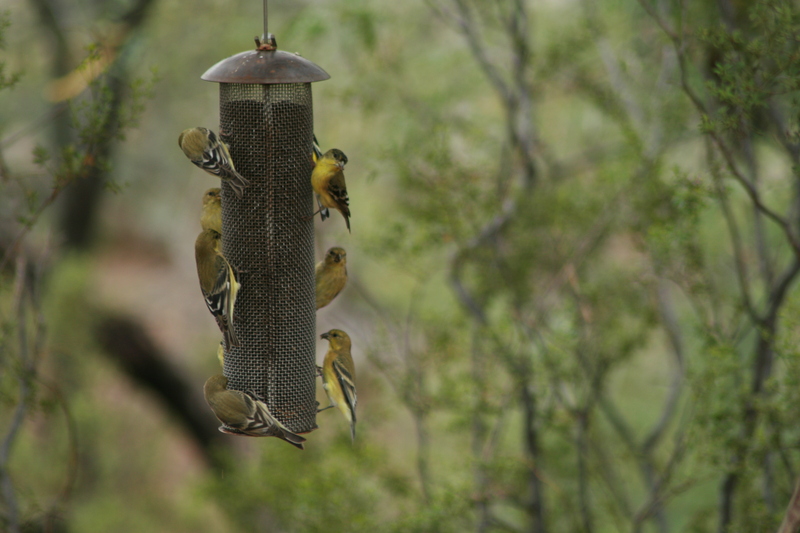 The goldfinches are just as brave with their neon yellow bellies, fighting with the larger less colorful finches for a spot on the feeder. A yellow butterfly twinkles through the air, flitting to the left, wings flap, flap flapping and then to the right, flap, flap flap, before disappearing over my head. I wonder how they survive with all these birds around. 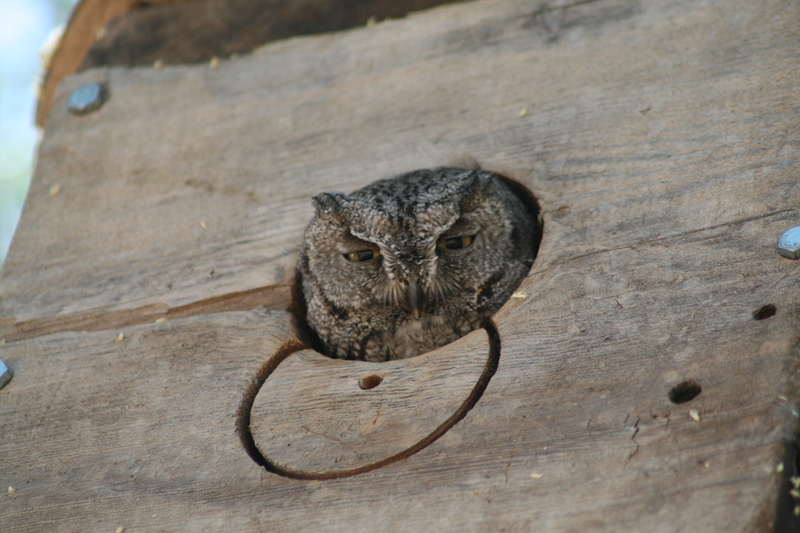 It has been some time now since I have seen the owl that lives in the owl box high in the mesquite tree. In the spring and through June he would poke his head out, his head filling of the round hole opening of his wooden house, his big round yellow eyes dropping and squinting against the sunlight, one large claw hooked around the edge of the opening, he would peer at me stealthily through those slit eyes. He is dormant now that his mating season is over and I wonder if he is still there. I wonder also if the white-winged dove’s eggs are hatched. I last saw them three days ago in the grapevine garden at the side of the house, the nest thatched together with twigs and branches, wedged into the vines just above eye level making it easy to see the bright white eggs nestled together as I stand on tip toes. The chatter of birds now dominates the cooing of the doves or the sharp piecing squawk of the woodpeckers. More light sabers buzz my ears. A swallow dives across the sky and disappears over the roof. 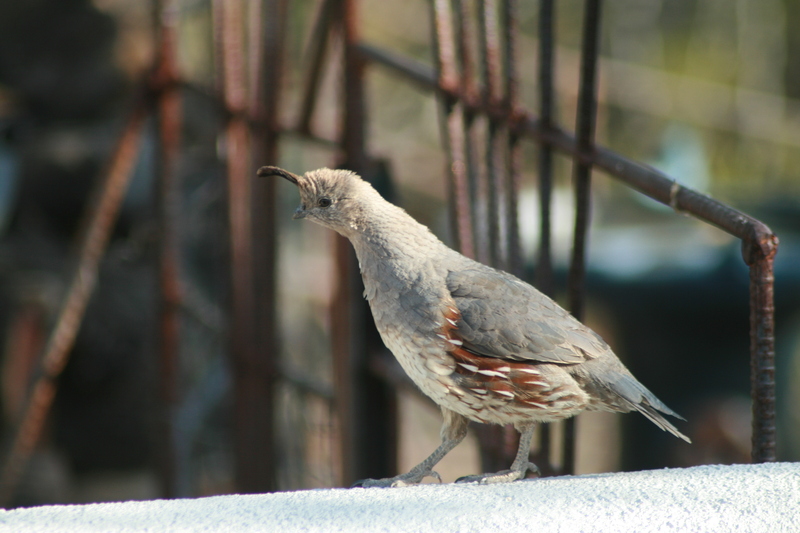 A white-winged dove has just landed on the little garden fence in front of me, he is surprised to see me so close and walks down the fence, hopping into the bird feeder, taking a drink before flying to a low hanging perch on the mesquite tree. A light breeze passes by, fluffing my hair a bit from behind before dying away, the breeze is soft on my skin, the perfect temperature, like a lovers touch. The Dove attempts to interject his thoughts, but is ignored by the cheerful chatter of finches and sparrows, he continues anyway with his soft, more serious almost mournful: coo coooo, coo, coo, coooo, coo, coo. I must go in now because it is warming up just a little too much. But before I do I just need to watch two goldfinches drinking from the bird bath, they take their turns dipping for water as if they are marionettes, their heads being pulled alternately by strings. The quail did not visit the water bowl this morning. I set out a dish of water for out for King Tut, the pet desert turtle, but the quail seem to get more use from it. Usually they come trooping through, the momma quail in the lead, followed by the babies one at a time, the papa in his regal suit and bandit face sitting high on the wood stack watching as his young ones, now teenagers, make their way through the holes in the rabbit fencing that doesn’t keep out the bunnies. After every last teenager is through the fence papa looks around a bit, his duty is complete for the moment, and he can relax. Eventually, papa hops down from the wood pile and into the garden. The teenagers are now all huddled around the water dish, their barely notable top knots bobbing up and down as they reach in and out for a teeny gulp of water, momma standing off to the side making sure everyone is herded in for a drink. When all are sated, they take formation in line as they hop back through the rabbit proof fence, papa back on the wood pile counting to make sure all are present before hopping back down to take up the caboose position, all have their heads held high as if they are out on a fancy Sunday stroll in the park, mamma and papa’s top knot long and flapping with each step, the teenager’s top knots are not long enough to flap. One of the kids gets sidetracked and papa herds him back into line. A hummer decides to hover in front of me causing me to look up into his tiny proud upraised chest, wings beating fast like propellers at his side, I spot his needle sized beak pointed in my direction giving me the once over before darting off. I hear the garbage truck stop at the front of my house, sounds of machinery cranking as mechanical arms jet out to pull in and up our trash can, air-brakes hissing as the truck stops at the next house. It must be about 7:30 now, time to get going, but not before noticing the new inhabitants in the saguaro just past the mesquite tree. There used to be baby sparrows living there, in that grapefruit sized hole, three-quarters of the way up the saguaro, two babies opening their mouths wide for momma bird to fill them, they were all mouth, wide hanging open mouth in the sunlight at the entrance of the hole. Now I can’t make out what type of bird has taken up residence. I need my binoculars to see them clearly. The baby sparrows left before the monsoons came at the end of June. Now it really is time to move indoors and start my day. The temperature was perfect when I first sat down out here in my sleeveless PJs, but now it is warming up, my PJ’s are sticking to my skin. Soon it will be blazing hot. The day was filled with firsts. My husband and I woke up after spending our first night in an apartment we rented in Perugia, Italy in the heart of Umbria. I opened my eyes to see an arched brick ceiling, part of a medieval tower. We had seen pictures of that ceiling on a website when we put our down payment on it earlier in the year, but in person the ancient mortared bricks with their graceful arc, reaching from each corner of the room, were so much more perfect. It was the first morning peering out the open shuttered window, seeing the swallows swoop around the valley below. Most importantly, it was our first morning walking up the steep hill to the top of the piazza and back down the other side to the immersion school where we would start Italian class. It had been a dream of mine to go to Italy and take an immersion course for as long as I could remember. I was fifty three years old when the plan to go was finally beginning to take shape. However, before we made any of the reservations, I was diagnosed with ovarian cancer. I was diagnosed in May and our plans had been to leave for Italy the next year and stay for the summer. Throughout my treatment for cancer, I calculated out my recovery period. I could not let go of this trip to Italy. I wondered often if I would choose to go to Italy and learn a foreign language if I really was on my last breath; if I could not beat this cancer. I held on to that trip to Italy like an anchor keeping me healthy. I did not allow myself to think of death: I would recover and I would go to Italy to learn Italian. As I walked across the piazza on my way to Italian class with jet lag pulling at my ankles and hazing my vision, I could not help but snap awake to the fact that I was alive and cancer free. The anticipation that I would finally be learning a foreign language in Italy, which had been my guiding light for so long, suddenly dulled in comparison to the fact that I was alive and living life. That in the end was the miracle.